College Park is a city in the U.S. state of Georgia, adjacent to the southern boundary of the city of Atlanta. As of the 2010 census, the population was 13,942. Hartsfield–Jackson Atlanta International Airport is partially located in the city’s boundaries (including the domestic terminal, Concourse T, Concourse A, and about two-thirds of Concourse B), and the Georgia International Convention Center, owned and operated by the City of College Park, is within the city limits. College Park is located on the border of Fulton and Clayton counties at 33°38′54″N 84°27′22″W (33.648209, -84.456007). According to the United States Census Bureau, the city has a total area of 10.1 square miles (26.1 km2), of which 0.019 square miles (0.05 km2), or 0.19%, is water. College Park’s City Hall is 8 miles (13 km) southwest of downtown Atlanta. Interstate 85 passes through the city and merges with Interstate 285, the perimeter highway around Atlanta, for a short distance in the southern part of College Park. I-85 exits 69 through 72 and I-285 exits 60 and 62 are located within the College Park city limits. The western part of Hartsfield–Jackson Airport, including its domestic terminal, occupies the eastern side of the city. The Metropolitan Atlanta Rapid Transit Authority(MARTA) provides heavy rail and bus services in College Park. The College Park Station is the primary station for College Park, located just south of Downtown, and is the third busiest station in the MARTA Rail System, with a weekday average of 9,023 entries. It is serviced by both the Gold Line and the Red Line during the day, and only the Gold Line after 9:00 PM. Route 172 – Sylvan Road/Virginia Ave. The community that would become College Park was founded as Atlantic City in 1890 as a depot on the Atlanta and West Point Railroad. The town was renamed Manchester when it was incorporated as a city in 1891. 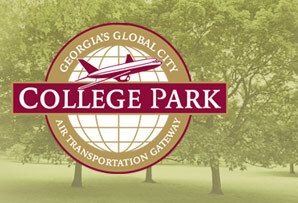 It was renamed again as the city of College Park in 1896. The city has 853 properties listed on the National Register of Historic Places by the United States Department of the Interior. The city’s name came from being the home of Cox College (where the city hall and other buildings now stand) and Georgia Military Academy (now the Woodward Academy). The east-west avenues in College Park are named for Ivy League colleges, and the north-south streets are named for influential College Park residents. The College Park Woman’s Club, one of the oldest in Georgia, is located in Camellia Hall on Main Street. College Park has three city recreation centers—the Wayman & Bessie Brady Recreation Center, the Hugh C. Conley Recreation Center, and the Godby Road Recreation Center) The 1st Two (Wayman & Bessie Brady Recreation Center, the Hugh C. Conley Recreation Center were opened in 1956 and named in honor of three prominent city residents, Wayman and Bessie Brady, and Hugh C. Conley. When they were opened, they were segregated; white people used the Conley Center, while black people used the Brady Center. Both were equipped with basketball gymnasiums. After desegregation took place, Conley was used for gymnastics and Brady was used for basketball. The Brady Center has one of the top-notch programs in Georgia. The city also has four parks: Barrett Park, which is located along Rugby Avenue; Brenningham Park, which surrounds the Brady Center; Jamestown Park; and Richard D. Zupp Park, which was named in honor of a well-respected College Park resident. College Park is home to the College Park Municipal Golf Course, which was established in 1929. The course is nine holes and is built on very hilly terrain. As of the census of 2000, there were 20,382 people, 7,810 households, and 4,600 families residing in the city. The population density was 2,099.8 people per square mile (810.5/km²). There were 8,351 housing units at an average density of 860.3 per square mile (332.1/km²). The racial makeup of the city was 81.81% Black, 12.39% White, 0.17% Native American, 0.61% Asian, 3.33% from other races, and 1.69% from two or more races. Hispanic or Latino of any race were 6.86% of the population. 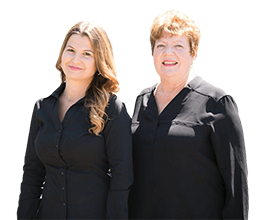 The city of College Park is governed by a mayor and four council members. The mayor is Jack Longino and the council members are Ward 1, Ambrose Clay, Ward 2, Joe Carn, Ward 3, Tracey Wyatt and Ward 4, Roderick Gay. College Park is currently undergoing expansion, annexing neighboring, unincorporated portions in both north Clayton and south Fulton counties. According to the Federal Bureau of Investigation’s annual Uniform Crime Report and the College Park police department, College Park had 13 homicides in 2008. College Park’s incident rate for violent crimes is much higher than most other American cities. 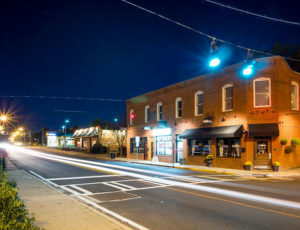 In 2008, College Park had the highest crime rate in Georgia. Many areas associated with College Park are not in the city proper; these areas are under the jurisdiction of the Clayton and Fulton County Police Departments, respectively. ExpressJet Airlines is headquartered in College Park, near Hartsfield-Jackson Atlanta International Airport. Chick-fil-A, a fast food chicken chain, is headquartered in College Park. Atlantic Southeast Airlines had its headquarters in College Park until December 31, 2011; its final headquarters facility was a hangar at Hartsfield-Jackson Atlanta International Airport. As of the 2014 American Community Survey, 39.9% of College Park residents live in poverty. Residential areas within College Park are served by the Fulton County School System. College Park Elementary School, Love T. Nolan Elementary School, G.W. Northcutt Elementary School and Harriet Tubman Elementary School are in College Park and serve College Park. 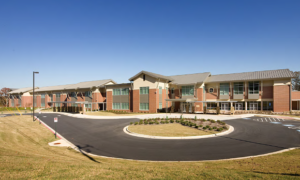 Other schools serving sections of College Park with residences include Hapeville Elementary School in Hapeville, Heritage Elementary School in an unincorporated area, and Oak Knoll Elementary School in East Point. Middle schools serving College Park include Paul D. West Middle School and Woodland Middle School, both in East Point. Benjamin Banneker High School in an unincorporated area and Tri-Cities High School in East Point serve sections of College Park. Frank S. McClarin Alternative High School is located in College Park. The section in Clayton County is served by Clayton County Public Schools. Woodward Academy is located in College Park. Atlanta-Fulton Public Library System operates the College Park Branch.